Hi lovelies! 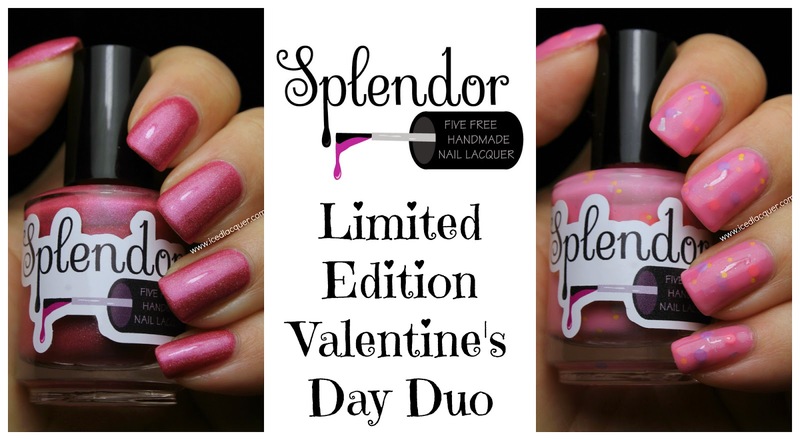 Today I have a limited edition Valentine's Day duo to share with you from Splendor Nail Lacquer. If you're looking for a gift for someone or even to treat yourself, these super cute shades are totally perfect. Even though they make amazing Valentine's Day shades, they're also great because either shade could be worn year-round. "Cupid's Kiss" - A super bright magenta scattered holographic with just the tiniest bit of a purple sheen. Awesome coverage with this one. I used two coats plus top coat. "Cupcakes!" - A pale pink crelly base filled with pink and periwinkle dots, yellow hexes, aqua shards, and some fine iridescent shimmer. I added a tiny bit of thinner to this one and applied three thin coats plus top coat. Color names: "Cupid's Kiss" & "Cupcakes!" My opinion: This Valentine's Day duo is super festive and quite fun. "Cupid's Kiss" is so vibrant and gorgeous, definitely the pretties magenta holo in my collection. I really like the finished look of "Cupcakes" but I can't help but wish it didn't have the shards! There's nothing wrong with the polish itself, I just have always personally disliked shards. 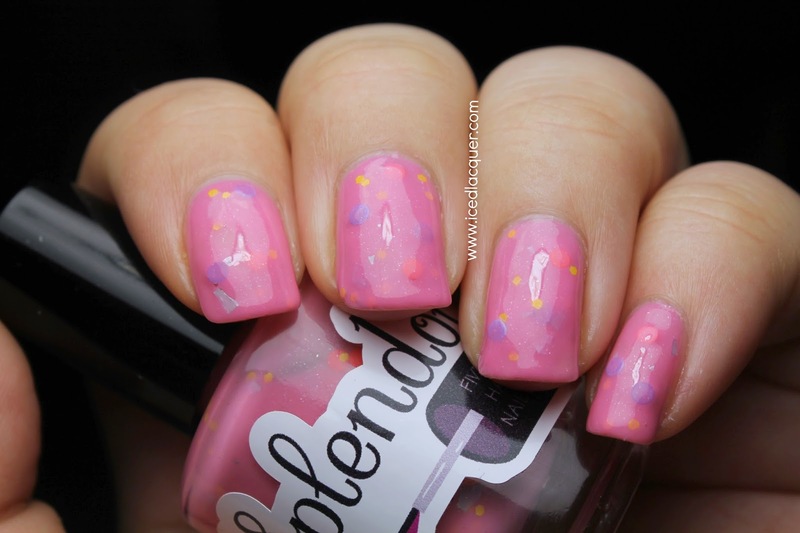 Maybe some mini bar glitters added in there would have been fun and totally represented sprinkles on a cupcake! Regardless, it's a super sweet Valentine's Day look. As always thanks for reading and I hope you have a happy Valentine's Day weekend! This is a cute duo! And I think the colors work perfectly. I agree! It would be fun to use one as an accent nail with the other. Cupcakes! reminds me of donuts from Simpsons: Tapped Out. Way cute!